Gardening tools are essential for maintaining your garden. You do not need loads of tools to get the job done but a few good quality tools can make your life a lot easier and the cottage garden easier to maintain. A good tip here is to buy only essential items that you need for your size cottage garden and buy good quality traditional tools. If they feel uncomfortable, or unnecessarily heavy after a few uses buy a new one that is better for you. A good quality spade and fork are essential for cottage gardening especially if you have a large garden or vegetable patch. I prefer ones made with quality steel and wooden handles as this is traditionally what the cottager would have used. I never use aluminium tools, they are just not the same. You need a spade and a fork for digging and lifting soil. A Dutch hoe is an essential tool used for weeding. You use a Dutch hoe flat against the soil and push away from you. On a Draw hoe the blade is more upright and you use it by pulling towards you. A Three-pronged hoe is slightly heavier but very useful. A rake is another tool that is inexpensive to buy and works great on finer soil. For trimming hedges a good quality pair of hand shears should do the job. For trimming tougher jobs a pruning saw may be necessary. If you have a small cottage garden it is possible that the only gardening tools you may need are the hand trowel and hand fork. Both these tools are essential in any garden and as these tools do not cost as much as the others you can buy the best that you can afford. 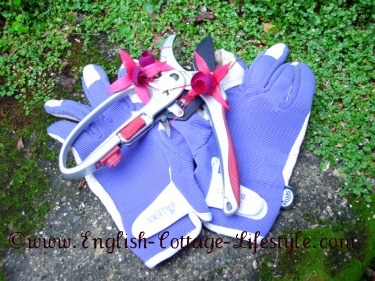 Secateurs or pruning shears are excellent for cutting. An anvil pattern has a blade cutting onto a flat edge you use this type on hard or old wood. Scissor action or bypass secateurs have two blades, like scissors, you use these on roses as they are more gentle and do not damage the plant. A good pair of gardening gloves are essential especially when pruning roses or anything with thorns. A watering can is invaluable for container gardening or if you have a small cottage garden. They come in large or small sizes just make sure that you can carry it when it is full of water. If it is too heavy either fill it halfway or buy a smaller size watering can. I like to leave mine out in the rain to collect rain water. A good quality hose is another essential gardening tool especially if you have a large garden. You may also want to buy a wall holder for the hose to stop it from laying on the floor. Take care of your gardening tools and they can last years. Even if you are tired make sure you clean the soil or debris off any tools after using them. Wipe them with an old cloth and then go over them with an oiled cloth, tools made of stainless steal will need less oiling. It is always a good idea to have an ‘autumn clean’ at the end of the gardening season before storing them for winter. When English gardening was in its early days the main tool used was the hoe which was quite heavy back then. It was used for all gardening jobs from digging to weeding. The more grander English country gardens would have used all kinds of tools hand made for specific jobs by the blacksmith. The cottager of old managed with very little so if you are on a tight budget just get what you think you will need the most, you can always add to your tool collection later, the most important thing is to get outside and enjoy yourself with nature.